Every human mind carries a different perspective for a ‘perfect life’ despite the fact that no one ever gets a ‘perfect’ one. Life is never a garden of roses but a blend of several ups and downs. The course of life is mysterious which cannot be predicted. For some people it is a divine gift while for some others it is a burden to be carried till the end. What make it alluring are the dreams that we envelop within our lives. We all have dreams, while some have grand ones; some hold simple dreams for a blissful life. 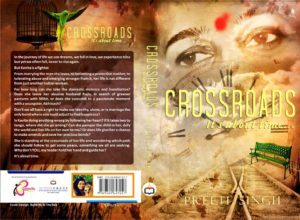 Crossroads is the story of Kavita and her journey of life. It is a metamorphosis of a meek girl into a confident empowered woman. She is a simple girl who is prone to fantasies rather than realities of life. 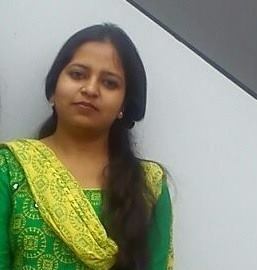 Brought up in loving environment, she has a small family including her best friend Shubhi. She is not ambitious for a high profile career, what all she wishes in life is love; a loving husband and a sweet home. It is said that sometimes not getting what we want is a wonderful stroke of luck. But Kavita does not get that luck and her dreams come true when she meets Rajiv. He is young handsome and well behaved person. He seems perfect match for her, they get married and a new journey begins. Kavita is delighted as never before, blossomed in ecstasies of togetherness. Their family completes with their daughter Hitakshi. But nothing in life lasts for long, and so, their happy moments start fading away. The mask of a gentleman is now slipping down. Later she realizes he is weak and being manipulated like a puppet by his own sister. He becomes aggressive, violent and indifferent towards her. All her dreams are shattered even though she tries with her whole being but she terribly fail. She is left broken from within and lost her charm but she has neither courage nor the will to leave her husband. Similarly Kavita is reluctant about leaving Rajiv ever. She has to accept the reality and leave her home behind. It is not easy for her at all; however, she has no other option left than to leave. There comes countless hardships in her life but with the help of family, friends and several admirers, she established herself as an author. She has been a loving mother and best friend of her daughter. It is her firm belief and support which helps Hitakshi to secure admission in MBBS course. Life is going smooth when she finds herself on the crossroad where choosing one direction is arduous. She is supposed to choose between Mihir, who has been her admirer and Rajiv. At such crucial moment her bold initiative wins the respect of the readers. Her decision reflects her strength that she is not the old Kavita who is blind in love. She has grown up as a matured woman. The novel does not tell an extraordinary story as similar things are happening around in our society, however the way of telling the tale is extraordinary. It encourages the spirit of a fighter within each one of us. Being an inspirational story, most women can relate to it as it provides a hope for better life. Major part of the story is told in flashback technique. All the characters are drawn from the real life people. Twitter, the talking parrot and dog Amber along with many Hindi songs give the book a filmy touch. The author is quite well while dealing with sensuous writing which never cross its limit. It is the second novel of the writer Preeti Singh who acclaimed the Swayamsiddha Award for self-made women, by the Anupama Foundation. Also the book made its space in the India Book of Records as the first Indian fiction having real life people as characters. however, she shies away !